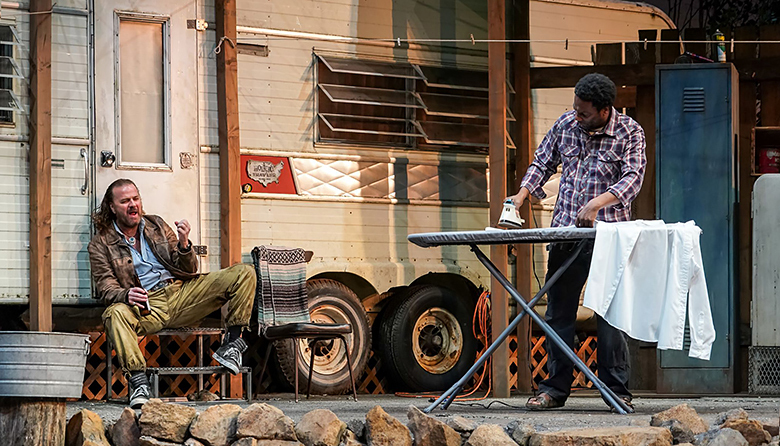 From the beginning to the end of his 2004 play Last of the Boys, running through Feb. 10 at Seattle Rep, Seattle playwright Steven Dietz makes a huge leap in subject, tone and approach. It opens as a tasty buddy comedy—a little Neil Simonesque, even, here and there—about two Vietnam vets who served together: Ben (Reginald Andre Jackson), now years later isolated and content in his trailer deep in Northern California, and Jeeter (Kevin Anderson), restless and discontent, who teaches college and spends summers with him. Dietz follows the Vietnam thread, through the arrival of Jeeter’s drifter girlfriend Salyer (Emily Chisholm) and her understandably bitter widowed mother Lorraine (Kate Wisniewski), to a bleak and high-strung indictment of the war, specifically a full body slam on Robert McNamara, Secretary of Defense from 1961 to 1968. Jackson also plays, or somehow represents, McNamara; it could be a flashback, or Ben’s imagination, but then, surreally, other characters acknowledge Ben-as-Robert, the conflation of the two roles. The white shirt Ben’s seen ironing at curtain-rise is his Chekhov’s gun, and he slips in and out of it and the character when confronted by The Young Soldier (Josh Kenji), a sort of walking Wikipedia article who recites casualty statistics and a timeline of the war’s events which McNamara scrambles to rationalize. Probably the younger you are, the more you’ll feel that Last of the Boys gets a bit baby-boomer navel-gazey (including Dylan and Creedence Clearwater Revival in the incidental music is not just period-appropriate, it’s also foolproof target-audience button-pushing)—but, here we are in 2019, yet again in a protracted land war in Asia, and 30, 40, 50 years from now, vets are going to have to confront these same issues all over again.